FREE SHIPPING FOR ALL OUR POKER TABLES AND CHAIRS WITHIN THE USA! Additional charges shall apply for Alaska, Hawaii and other territories. 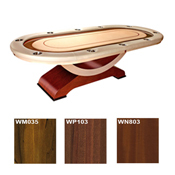 Choose your own wood finish, felt color, and armrest color! Poker Tables with Folding Legs for easy storage, flexibility and portability! Dining and Furniture Poker Tables! Our tables have solid Hardwood Pedestal Legs that beautifully complement the functionality and artwork of these Poker Tables! Poker Tables with or without Dining Tops available. Play with Professional Grade Casino Quality Poker Tables with our Pedestal Base Poker Tables, featuring here D' Ultimate Poker Table! With interchangeable color playing field felts! Poker on the Go? Then Poker Table Tops is the way to go! We have a wide variety of Table Tops and Poker Hoodys available.